Matt and Colleen love having kids aboard Firefly. Matt happily engages the children in the galley with rolling out fresh pasta, cutting and stuffing homemade ravioli and cookie making. Colleen has a full set of signal flags and kids get to decide what the word or phrase will be spelled out and flown from the yacht each day. Kids also get to name of all floating water toys... the more kids the merrier! 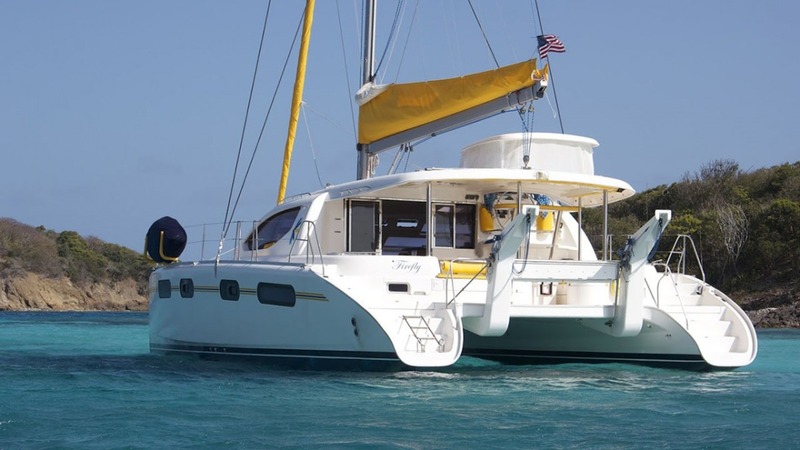 Firefly is a 46-foot Leopard catamaran with a crew of two. The yacht is fully air conditioned and accommodates up to 6 guests in 3 cabins, each with Queen berth and ensuite head (shower and electric toilet). Firefly has a 12-foot dinghy with 25 HP motor, tube, kneeboard, kayak, 1 standup paddleboard (SUP), snorkel gear, TV/DVD in salon, outdoor movie theater in cockpit, underwater camera, iPod dock, hammock, onboard wifi, etc. Matt is a Dive Instructor and Firefly includes diving and gear for certified divers (5 dives/wk). A resort course for non-divers is offered for $150/student. Have QUESTIONS or you'd like to BOOK? Contact Paradise Connections. Firefly currently has THREE special offers. View their details HERE. 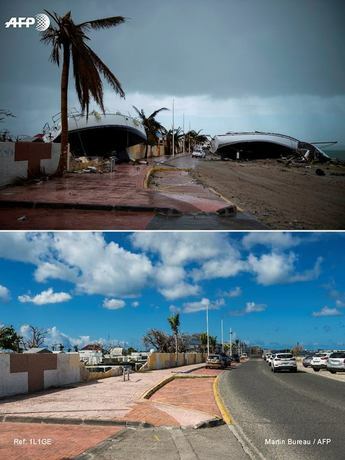 Just a few photos to show you hurricane recovery taking place on the island of St Martin. This site has a post with photos taken just after Hurricane Irma and a comparison photo of the same scene 6 months later (has it really been 6 months already?). It refers to AFP's (Agence France Presse) Facebook page. I really appreciate user Poisson Rouge pointing this out as we do not use Facebook. To view, go here. Click on a pair of photos and a pop-up photo window appears with the photos enlarged. Just below the black photo box are the player controls in a white font which I found difficult to see. There are 9 pairs of interesting pictures, so scroll through them. We have many yachts available for charter. Have QUESTIONS or you'd like to BOOK A CHARTER? The hurricane recovery for the Virgin Islands (both USVI and BVI) is progressing along. Foxy is Having a Party and EVERYONE is Invited to His 50th Anniversary Celebration! Foxy is having a party and EVERYONE is invited. Mark your calendars for Saturday, March 24, 2018 to celebrate 50 FOXY YEARS on Jost Van Dyke. 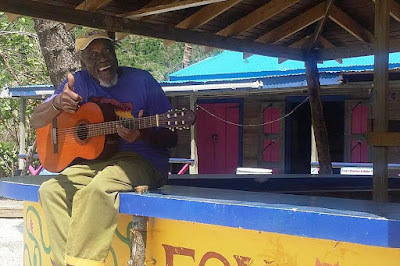 After unbelievable destruction to his bar and all of Jost Van Dyke, Foxy has worked to quickly get the world famous Foxy's Tamarind Bar open for business. 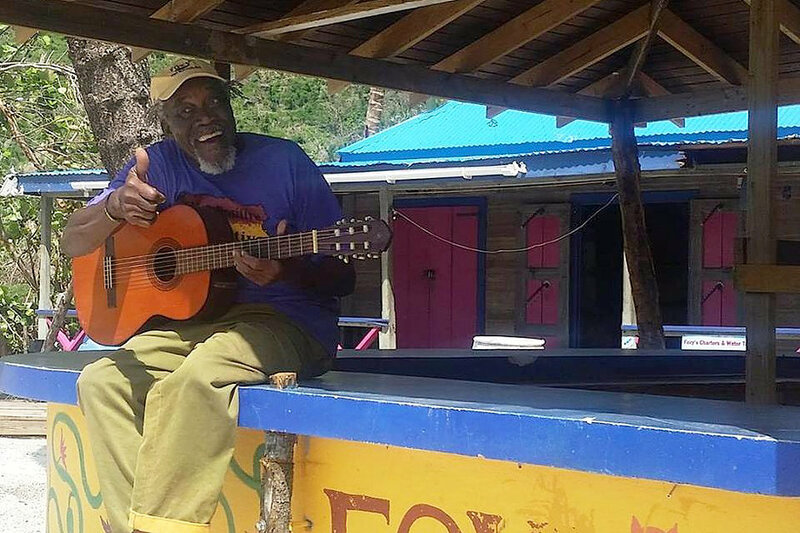 Foxy has been on-site constantly, encouraging everyone with his positive songs and spirit! On his Facebook page Foxy said, "The roof is still patchy, there is still random debris. The new "floating dock" makes drunken dinghy rides home a wee bit of a challenge. But we are getting stronger every day. Hope you're coming to see us soon!" Recently, Foxy's held their first Famous Friday Beach BBQ of the 2017/2018 season. Rumor has it there was juicy ribs, grilled chicken, mahi mahi and oh, that pasta salad to enjoy! Not to mention lots of rum, jokes by Foxy and shakin' your thing on the dance floor. Foxy says, "Come one, come all to Foxy's. Even Irmaria can't hold us back!" 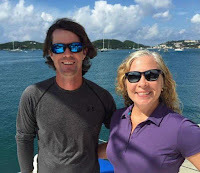 Matt & Kendra have returned to crew Charter Catamaran Knot Anchored. To encourage more bookings they are offering a discount for charters taking place by July 31, 2018. $1000 discount on all new bookings for charters taking place by July 31, 2018. This discount can be pro-rated for short charters, too. Knot Anchored also offers a Sleep Aboard option for the night before your charter. $200 per cabin, 2 cabin minimum. Dinner ashore at client expense. Includes boarding after 4pm, welcome cocktail, breakfast and an early start the next morning. Chef Kendra's interests include scuba diving, snorkeling, reading, kayaking, camping, and hiking. Kendra grew up in a family who loves to cook, and she continually expanded her experience cooking meals and desserts and entertaining friends and family. During her time sailing the islands, she has continued to refine her culinary skills. Kendra focuses on combining dishes from her Mexican- and German-influenced Texas hometown and infusing flavors of the islands. 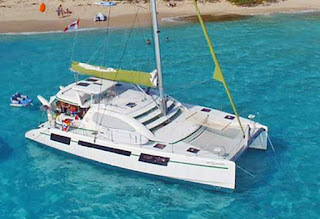 Catamaran Knot Anchored is a 46-foot Robertson & Caine catamaran with a crew of two, Matt & Kendra. The yacht is fully air conditioned and accommodates up to 6 guests in 3 cabins, each with Queen berth and ensuite head (has electric-flush marine toilet and separate shower stall).